I decided to take a Christmas approach while teaching the Tarnished Foil technique the other day and used the Holly embossing folder. 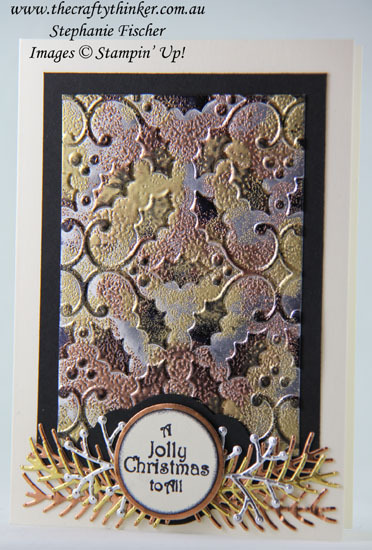 To finish the card, I added a Basic Black label cut with the Pretty Label punch and foliage cut with the Pretty Pines dies from gold, silver and copper Foil Sheet. I used a Basic Black Stampin' Write marker to ink just the greeting on the die from the Father Christmas stamp set, stamped it onto Very Vanilla cardstock and cut it out with the 1 1/4" circle punch. I then edged this with black ink before layering it onto a piece of Copper Foil Sheet cut with the 1 3/8" circle die. The basic card is made from an A5 piece of Thick Very Vanilla cardstock and there's a layer of Basic Black behind the tarnished foil piece.